I imagine what I would have seen if I had a seat in the upper South East facing room for one hundred and fifteen years. 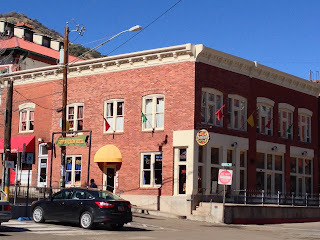 In addition to about 42,000 sunrises above the iron colored hills to the East, a good part of Bisbee history unfolded on this corner of Howell Avenue and Brewery Gulch. In 1910 I could watch as the first trolley car was inaugurated to a crowd of over 6,000 cheering men and women. From this sunny room in 1912 the first shot from a .45 caliber revolver celebrated the beginning of Arizona as a State. I could look across the hill to see the Glory Hole Mine shaft entrance, one of the most celebrated and productive mine shafts in the world. I could listen to the miners walk below my window on their way to the bars up brewery gulch in a twenty-four hour a day parade of commerce and commotion. No doubt the voices of Hollywood actors like John Wayne, Victor Mature, and Lee Marvin would walk below my window and pause to take in the vantage point as well. It was a corner of Bisbee that could see just about everything. 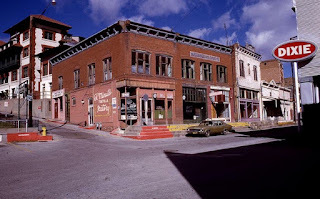 The building housed dozens of businesses from a Pharmacy, Western Union, bath houses, apartments, tortilla factory, and most recently the Miners Diner and popular French Bistro, Le Chen. Nearly 100 years later, it was completely renovated by business developer John Brinley, for whom it has been affectionately named by our family who purchased it in 2006. Mr. Brinley not only saved the building from collapse but also lovingly restored it to its current state and worked to ensure it would enjoy a future as a bustling business location. Santiago’s Mexican restaurant enjoys the privilege of being the longest continuously operating restaurant in the Brinley building along with the San Ramon Hotel directly above the restaurant. These business’s bookend 115 years of family history in Bisbee in what was once my French Immigrant Great-Grandfathers leasehold, the Central Pharmacy in 1901. I’m told if he looked to the South East he could see my Great Grandmothers boardinghouse. 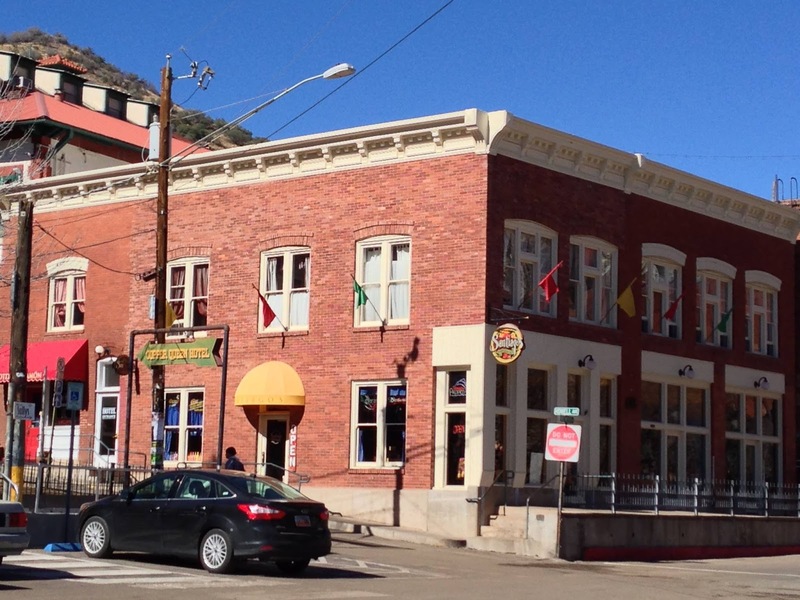 I wonder if he could have imagined his Grandchildren and Great-Grand children sitting in the Southeast window, the smell of family recipes simmering in the kitchen and the love and respect they had for the beautiful town called Bisbee. Check our Facebook page for up to date information and specials! 2005 all rights reserved.. Simple theme. Powered by Blogger.